In their paper “Ordered and Dynamic Assembly of Single Spliceosomes” appearing in Science this week, Brandeis postdoc Aaron Hoskins and co-workers use a combination of yeast genetic engineering, chemical biology, and multiwavelength fluorescence microscopy to work out the kinetic mechanism by which the spliceosome assembles on a model pre-messenger RNA prior to splice out an intron in the RNA. 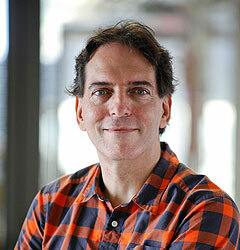 The work is a collaboration between Jefl Gelles’s lab in Biochemistry, Melissa Moore’s lab at UMass Medical School, and Virginia Cornish’s lab at Columbia. Hoskins et al. 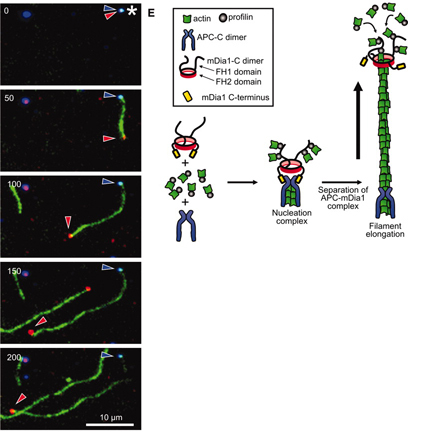 use a single-molecule fluorescence approach that dubbed “CoSMoS” (Co-localization Single Molecule Spectroscopy), originally developed in the Gelles lab by Larry Friedman and Johnson Chung, that is a powerful method to study the assembly and function of the complex macromolecular machines that perform a wide variety of biological functions. In this movie, shown 150x faster than real time, the comings and goings of many U1 spliceosome components on a surface-tethered pre-mRNA are shown as the appearance and disappearances of white spots. The white spots orginate from the fluorescence emission of specifically labeled U1 components upon excitation with a 532nm laser. 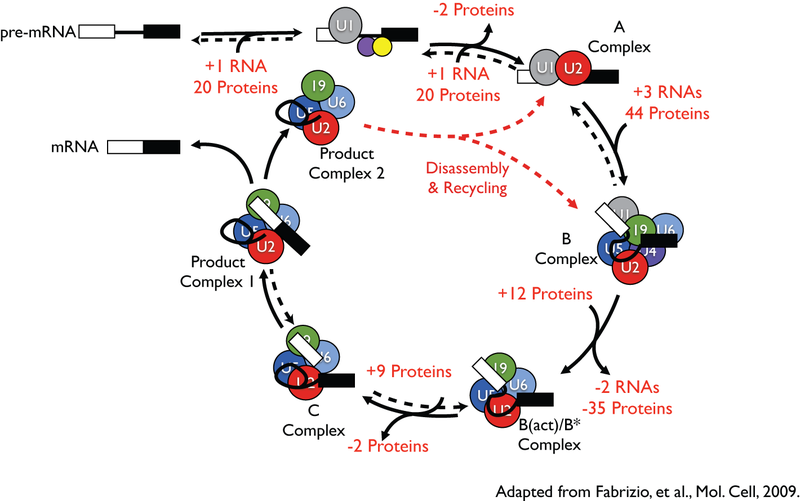 Pre-mRNAs are spliced in a complex cycle wherein the spliceosome assembles, is activated for catalysis, performs two transesterification reactions, and disassembles on every turnover. Steps between the isolatable intermediates depicted in this cycle involve the coordinated association and dissociation of many spliceosome components. A key finding by Hoskins et al. is that spliceosome assembly is reversible, and this is represented by the dashed arrows between the pre-mRNA, A, and B complexes. 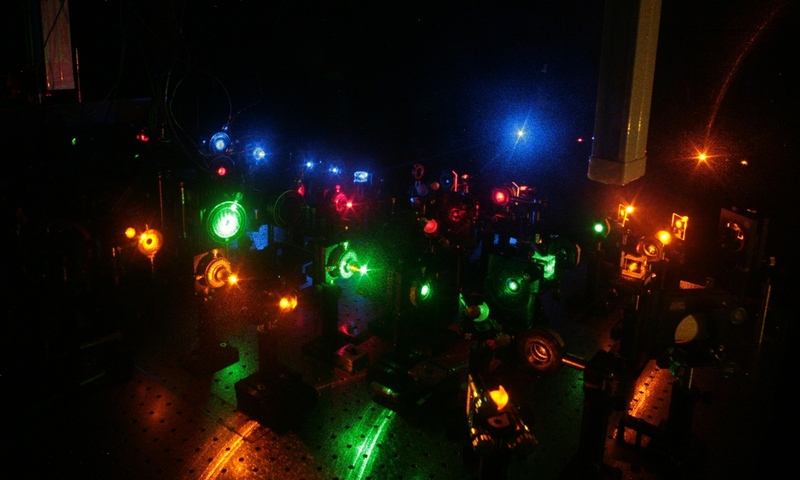 The multi-wavelength, total internal reflection fluorescence (TIRF) microscope built by Larry Friedman and Johnson Chung in the Gelles laboratory uses lasers of different wavelengths to excite spectrally distinguishable fluorophores on various spliceosome components. Photo by Diane Katherine Hunt. By far, the most challenging aspect of the project was determining two completely orthogonal methods for attaching fluorophores to endogenous spliceosomes in whole cell extract. Since these experiments are quantitative, we needed to find methods that give a very high degree of fluorophore incoporation and specificity (in other words, 10% labeling would not cut it!). The novel part, for me, is that for decades spliceosome kinetics have been “off-limits” to enzymologists due to the complexity of the system. However, by developing the correct analytical tools, the spliceosome can be studied in detail usually reserved for enzymes orders of magnitude smaller. Hoskins plans to continue these single molecule studies of the spliceosome in his new lab in Wisconsin and will be focusing on splice site selection and coupling of nuclear RNA processing events. 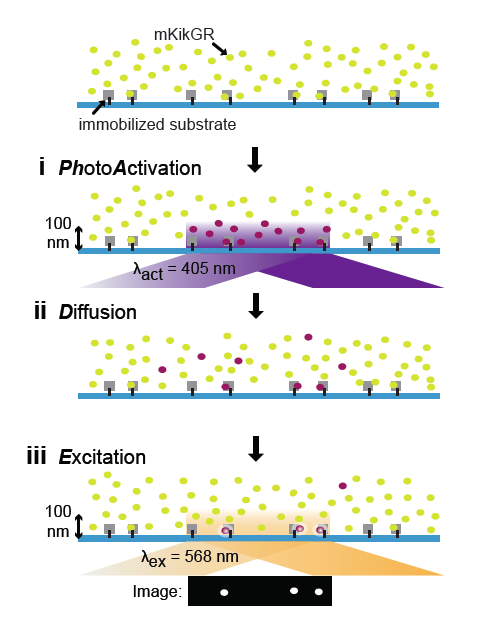 He also aims to develop new methodologies for fluorescent labeling of ribonucleoproteins in vitro and in vivo.